The spinach plants responded to the rain and longer days and leaves were large enough to harvest last week. They were perfect enough for a winter salad but instead became the greens of choice for a hearty soup. The next harvest will be for a salad. The fruit of the Nagami kumquat tree grow in clusters. The fruits themselves are oval with a smooth pebbled surface. They ripen within a month from green to brilliant orange. Once mature, the fruit can reach up to 2 inches in length. Unlike citruses, the entire fruit is edible, although the few seeds buried in the flesh are recommended to be spared. The peel is where the true citrus sweetness lies in both aromatics and flavor. The flesh delivers a tart and juicy contrast, and if eaten whole, makes for a perfectly sweet-tart mouthful. I’m planning a blog post in a day or two on kumquats and you can see the marmalade and learn more about this delightful small fruit. If you live in a region where you can grow citrus, you could try a kumquat. My little tree grows in a container on a sunny patio. Here’s a basket of garden goodness delivered to my friend and neighbor, Betsy. She’s been a source of encouragement to me in my blogging over the years. As a writer, she’s edited some of my earlier essays. And she loves vegetables. I harvested two large heads of broccoli this week and another two remain. As I prepared to steam these pieces I was taken by their loveliness. Broccoli, lovely? I decided they deserved a photo. Celery leaves and celery salt. I harvest celery stalks from the garden as I need them. Each comes with quite a tassel of leaves, not all of which I can use. Recently I made several cups of celery salt in short order. It makes a nice gift. 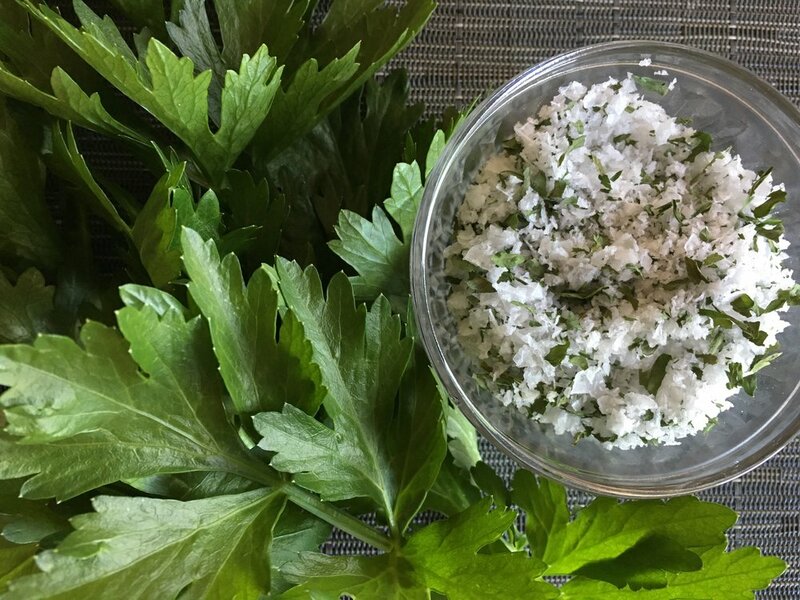 Stop back by later this week for a blog post on how to make celery salt. I’ll close with daffodils, just beginning in my garden. I relocated four clumps a few weeks ago to make room for two new fruit trees. They seems to be doing well and I pass by them many times each day on the way to the garage. See what other garden bloggers are harvesting at Harvest Monday, hosted by Dave at Our Happy Acres.